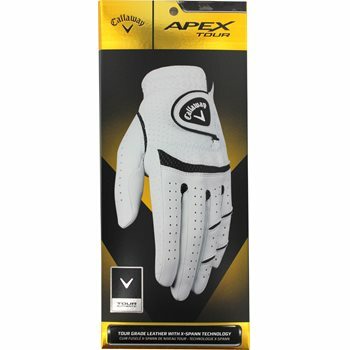 The Callaway Apex Tour golf glove is constructed with Opti Feel™ Leather which delivers premium feel, fit and comfort. The Apex Tour features perforations on the palm, top of hand and fingers for improved moisture reduction and increased breathability as well as an Opti-Fit™ adjustable closure system, and X-Spann™ technology. APEX is a brand that Callaway acquired from Ben Hogan. It represents premium equipment and this glove qualifies. It provides a great fit and feel, what I think of as 'grip feedback'. "Yeah, sure" you say, "how important can a glove be?" The glove helped me focus on loosening the LH "death grip" that was helping me slice. Saved me a few strokes on the fairway and in the tee box. It matters. I have come to expect the best from Globalgolf. Anything less is disappointing. I wish you well and look forward to continued success. Best of wishes. I previously wore the Footjoy Weathersoft but I tried one of these when I received it as a gift. It feels great, holds up for longer than the Weathersoft and can be found for a pretty good price here on Global Golf.